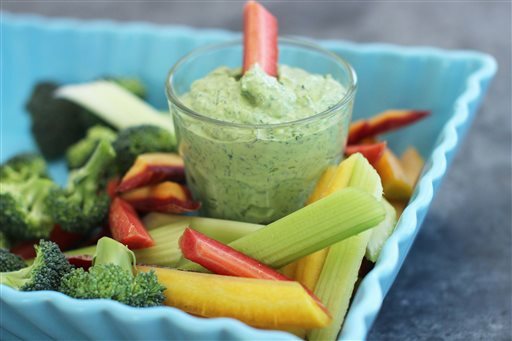 Healthy Food: Feeling peckish for pesto? Don’t limit yourself to basil! Fresh herbs are one of nature’s best low-cal flavor sources. And as the weather warms up, we’ll transition from buying herbs in cute little clamshells costing a couple bucks each to scooping large bunches of soft-leaved herbs into our carts for pennies on the dollar. Or perhaps you have an herb garden and you’ll find yourself inundated with a cilantro or parsley plant that takes over a small section of your backyard. What to do with all these herbs? One approach to preserving herbs is to freeze them as cubes. To do this, you simply blend up clean, fresh herbs with just enough oil or water to make a thick paste. You then fill ice cube trays (silicone muffin cups also work) about halfway with the herb paste and freeze. Once frozen, the herb cubes can be bagged and stored in the freezer until needed. Note that water-based herb cubes freeze more firmly than oil-based, but herbs discolor more in water. Either way, these cubes are easily added to soups, stews, sautes and chili. For the best effect, add them toward the end of cooking so the fresh flavor of the preserved herbs really comes through. 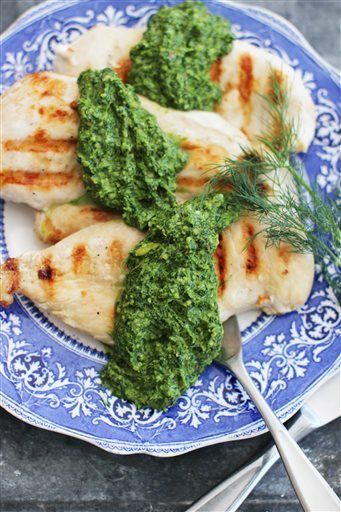 Another favorite strategy for making the most of my herbs is pesto. But don’t assume you’re limited to the classic basil version. 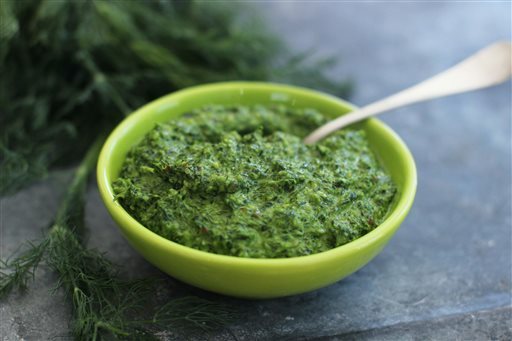 Using my simple formula, you can use just about any herb or green (or combination) to make a tasty pesto perfect for pasta, seafood, dipping bread, spooning over a hot soup, or any other favorite way to use pesto. It also freezes well as cubes. Once you jump on the pesto ice cube train, you will be amazed at the many uses: Add to scrambled eggs; use as a sandwich spread; whisk with Dijon mustard, red wine vinegar and water to make vinaigrette; spoon over meat hot off the grill; toss with roasted veggies; mix with an equal amount of Dijon and spoon over chicken breasts before roasting; mix with Greek yogurt for veggie dip. You get the idea. The formula is simple: 4 cups of fresh green herbs plus 1/3 cup of nuts or seeds plus 1/2 cup olive oil or broth (or a combination) plus 1/4 cup hard Italian cheese. Blend until chunky or creamy. Done. 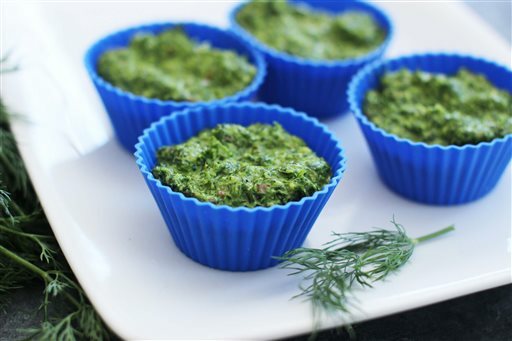 In a blender or food processor, combine the parsley, dill, almonds and garlic. Pulse until finely chopped. Add the oil, broth, Parmesan and salt, then blend to desired consistency. Use immediately, or transfer to a small bowl, cover tightly and chill. Alternatively, spoon into ice cube trays (fill cubes only halfway) and freeze. Pop out frozen pesto cubes and keep in a zip-close plastic bag in the freezer. Nutrition information per serving: 110 calories; 90 calories from fat (82 percent of total calories); 11 g fat (1.5 g saturated; 0 g trans fats); 0 mg cholesterol; 3 g carbohydrate; 1 g fiber; 0 g sugar; 3 g protein; 90 mg sodium. Reblogged this on Rachel Bouman.